This Lusatian mustard specialty contains a well rounded blend of 20 different spices and tastes very flavorful and aromatic. 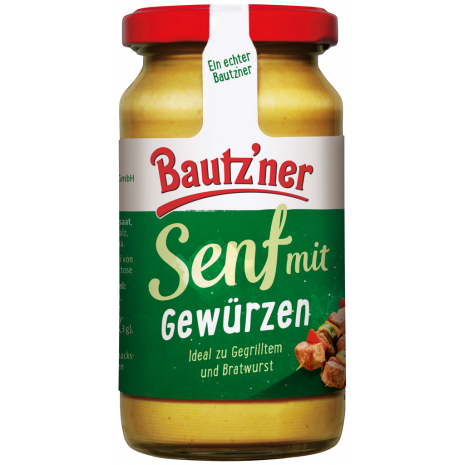 It goes well with goulash, roulades, Wieners and Bratwurst but is also suitable for the preparation of mustard sauces. Available in the 6.76 fl.oz jar. The eastern German city of Bautzen has been famous for their quality mustards since 1866. The Bautz'ner brand was founded in 1953 and is continuing this long tradition of great mustard in Bautzen to this day. This Lusatian mustard specialty contains a well rounded blend of 20 different spices and tastes very flavorful and aromatic. It goes well with goulash, roulades, Wieners and Bratwurst but is also suitable for the preparation of mustard sauces.